Fig. 1: Energy distributions of 19.68 MeV protons after traversing 0.2675 g/cm2 and 0.497 g/cm2 aluminum. Dots: Experimental data from [C. Tschalär and H.D. Maccabee, Phys. Rev. B1 (1970) 2863]; Solid line: SIMNRA 7 calculation using a two-piece normal distribution for electronic energy-loss straggling; Dashed line: SIMNRA 6 calculation using a Gaussian energy distribution. From [Mayer10]. Fig. 2: Backscattering of 2000 keV protons from graphite at a scattering angle of 165°. 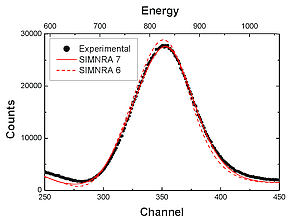 Dots: Experimental data; Solid line: Simulation with SIMNRA 7 using improved treatment of resonant cross-sections; Dashed line: Simulation using SIMNRA 6. The SigmaCalc cross-section was used for both simulations. From [Mayer14]. Fig. 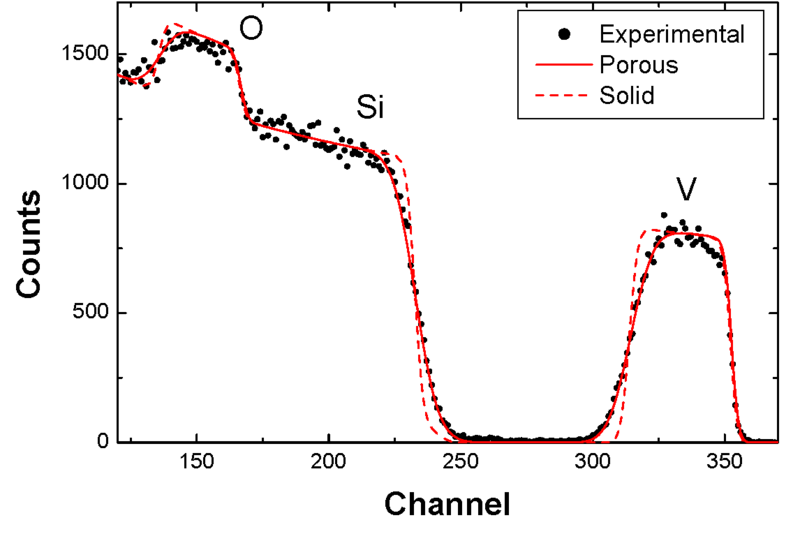 3: Backscattering of 1500 keV 4He ions from a silicon grating on top of a tantalum interlayer on top of silicon substrate. Top: Focused ion beam cross-section through the sample structure. Middle: Schematic representation of the measurement geometry parallel to the silicon grating structure, scattering angle 165°. 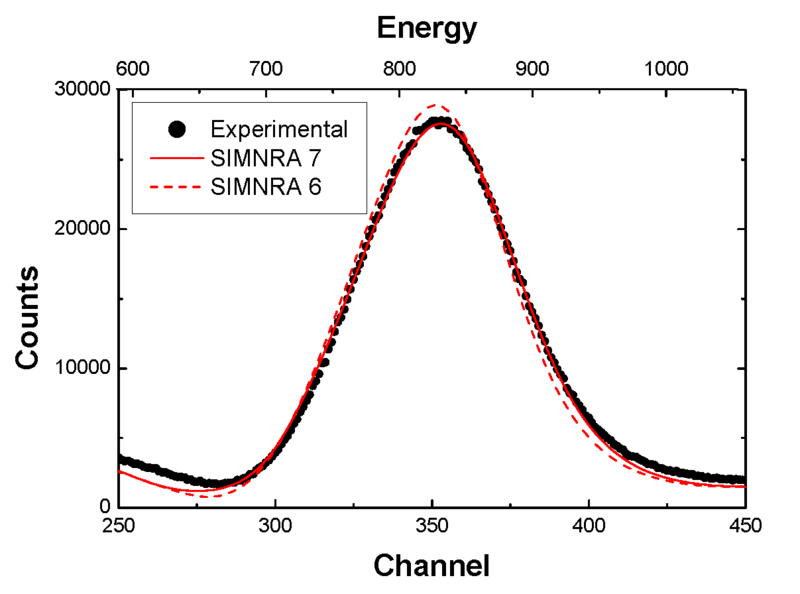 Bottom: Experimental spectrum (black dots) and simulation (red line) with SIMNRA 7. From [Langhuth11], [Mayer16a]. Fig. 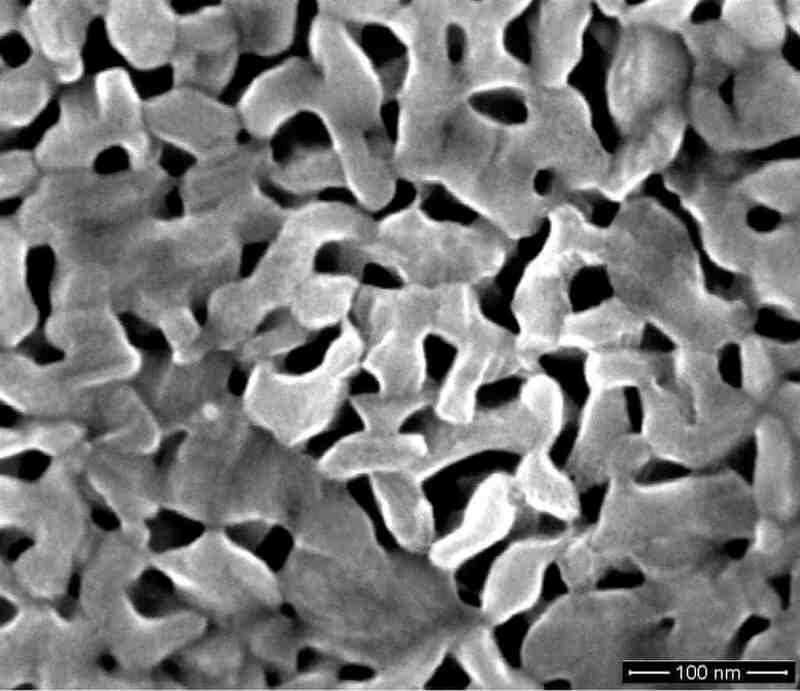 4: Top: Scanning electron micrograph of a porous V2O5 layer. 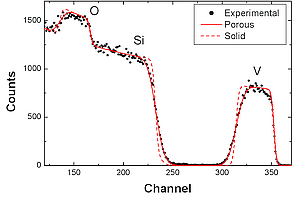 Bottom: Backscattering spectrum of the porous V2O5 layer on silicon substrate using 1500 keV 4He ions at a scattering angle of 165°. Dots: Experimental data; Solid line: Computer simulation with SIMNRA 7 assuming a porous layer with 40% pore fraction and a pore diameter of 31 nm; Dashed line: Computer simulation assuming a dense layer. From [Mayer14]. Fig. 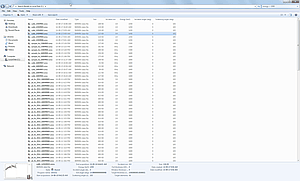 5: Windows Explorer view with extra-large thumbnails of SIMNRA data files. Additional information about the file content is displayed in the details pane at the bottom or as infotip. Fig. 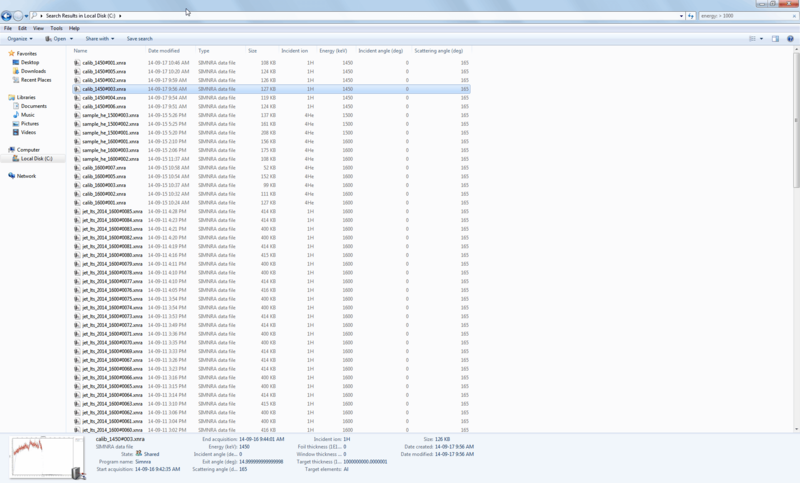 6: Windows Explorer view with file details of SIMNRA data files. Only data files with incident energy larger than 1000 keV are displayed, see the Search field in the upper right corner. The program SigmaCalc by A. Gurbich can be included, allowing calculating cross-section data for non-Rutherford scattering and nuclear reactions for many ion-target combinations at any angle. 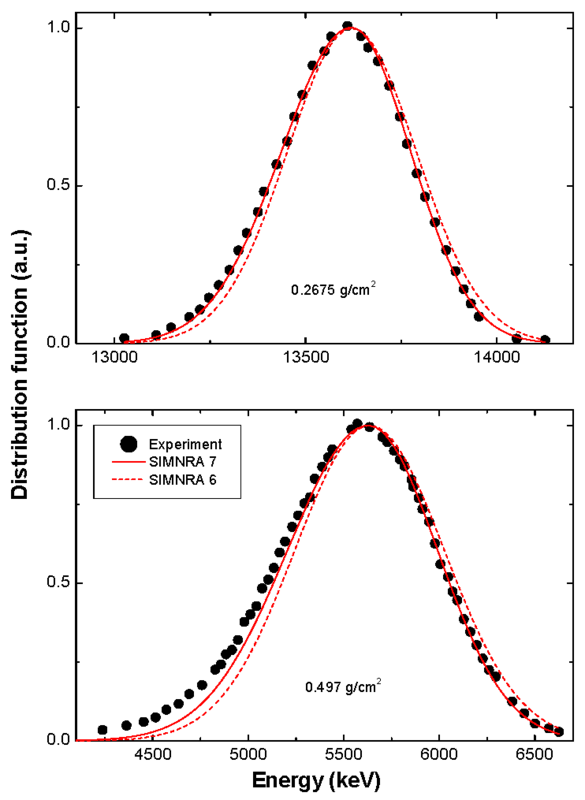 Calculation of gamma-ray yields by particle-induced gamma-ray emission (PIGE) (requires SIMNRA version 7.02 or higher). Skewness of energy spread distributions: All energy spread distributions are approximated by two-piece normal distributions instead of Gaussian functions. This improves the accuracy of spectrum simulation by taking mean value, variance and third moment into account. See Fig. 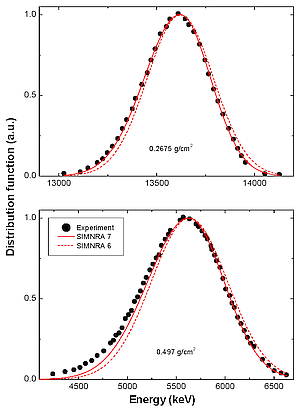 1 for an example: The measured energy distributions are better approximated by the SIMNRA 7 model. Improved treatment of cross-sections with structure, see Fig. 2, resulting in improved accuracy for the simulation of non-Rutherford scattering and nuclear reactions. Generalized layer roughness allows to describe various layer thickness distributions, see Fig. 3 for an example of a grating structure. 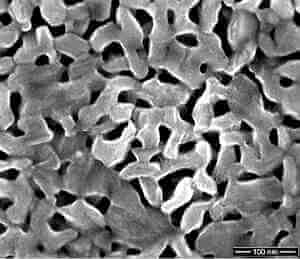 Porous materials and layers, see Fig. 4. Arbitrary window for external beam. Universal scattering cross-section based on the universal potential for simulation calculations at very low energies, for example for medium energy ion scattering (MEIS). Improved list of reactions with clearly arranged list of possible data. Possibility to resize experimental spectra to N channels; Optimized smoothing of experimental data. Modernized user interface with support for high-resolution devices until 200 dpi. 32- and 64-bit versions of SIMNRA. Improved programming support: Full access to all properties of all SIMNRA objects through OLE automation. 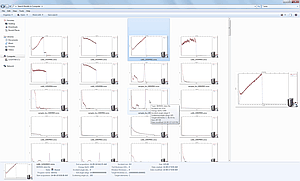 SIMNRA 7 uses the XML-based IBA data format as its native file format for storing spectra and all input data allowing easy exchange of data between different ion beam analysis programs. Smooth integration into the Microsoft Windows environment by thumbnail providers and property handlers allowing to display thumbnail images of SIMNRA data files and providing additional information about the file content, see Fig. 5. 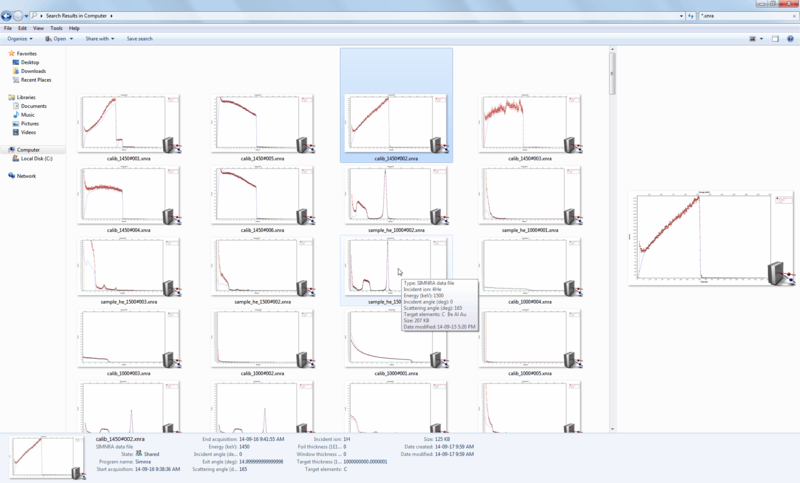 Integration into Windows Search allows to search for specific files based on file content (for example ion species, beam energy), see Fig. 6. A full list of changes from version 6.0 to version 7.0 can be found in the file CHANGES 7.0.TXT.